Morimoto, Y. V., Namba, K. and Minamino, T. (2017). Measurements of Free-swimming Speed of Motile Salmonella Cells in Liquid Media. Bio-protocol 7(1): e2093. DOI: 10.21769/BioProtoc.2093. Minamino, T., Morimoto, Y. V., Hara, N., Aldridge, P.D. and Namba, K. (2016). The bacterial flagellar type III export gate complex is a dual fuel engine that can use both H+ and Na+ for flagellar protein export. PLoS Pathog 12(3): e1005495. Bacteria such as Escherichia coli and Salmonella enterica swim in liquid media using the bacterial flagella. The flagellum consists of the basal body (rotary motor), the hook (universal joint) and the filament (helical screw). Since mutants with a defect in flagellar assembly and function cannot swim smoothly, motility assay is an easy way to characterize flagellar mutants. Here, we describe how to measure free-swimming speeds of Salmonella motile cells in liquid media. 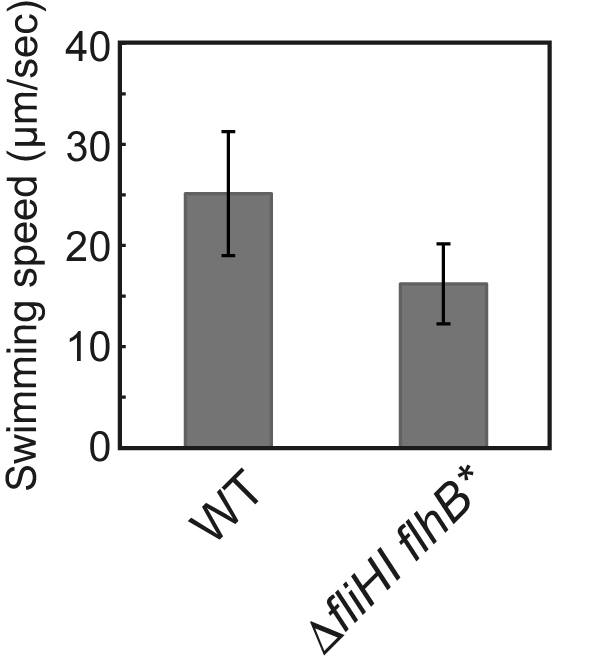 Free-swimming behavior under a microscope shows a significant variation among bacterial cells. The flagellar motor of E. coli and Salmonella is powered by downhill proton translocation along proton motive force (PMF) across the cytoplasmic membrane (Morimoto and Minamino, 2014; Minamino and Imada, 2015). The rotational speed of the proton-driven flagellar motor is proportional to total PMF (Gabel and Berg, 2003). Therefore, measurements of free-swimming speeds of motile cells allow us not only to analyze motor performance of various mutants but also to examine whether there is a significant difference in total PMF under experimental conditions (Minamino et al., 2016). Note: This product has been discontinued by the manufacturer. Note: Carry out procedures at ca. 23 °C unless otherwise specified. Pick a single colony from L-broth agar plate and inoculate it into 5 ml of fresh TB. Incubate overnight at 30 °C with shaking at 150 rpm. Transfer 100 µl of the culture into a 1.5 ml Eppendorf tube. Collect the cells by centrifugation (6,000 x g, 2 min). Suspend the cell pellet in 1.0 ml of fresh TB. Centrifuge at 6,000 x g for 2 min. Resuspend the cells in 1.0 ml of fresh TB. Make a tunnel slide by sandwiching double-sided tape between glass slide (bottom side) and 18 x 18 mm coverslip (top side) (see Figure 1 and Video 1). Figure 1. Tunnel slide for observation of bacteria cells under optical microscopy. 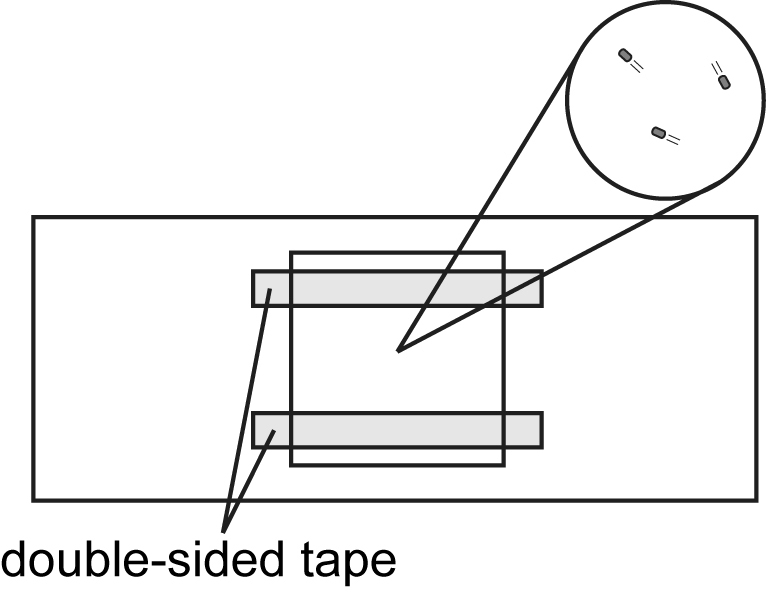 Double-sided tapes are sandwiched between a glass slide (bottom side) and an 18 x 18 mm coverslip (top side). Cells are added to the space between the glass slide and the coverslip. Observation area is magnified in a circle. Add the cell suspension to the tunnel slide and absorb excess medium with a piece of filter paper. Set the tunnel slide on the stage of a phase contrast microscope. Select a 40x objective lens. Observe motile cells under the phase contrast microscope. Record a movie of motile cells for 10-30 sec with a hard-disk video recorder. Move a field of view under the microscope. Repeat steps 14 and 15 more than 5 times. Capture an image of an objective micrometer in the same setting. Tansfer the movies recorded on the hard-disk video recorder to a DVD. Calibrate a scale of a movie using the image of the objective micrometer. Track motile cells in the movie with the length of 1 sec (30 sequential images recorded at 30 frames per second) using a motion analysis software Move-tr/2D (Library Co., Tokyo). Measure the velocity (µm/sec) of each cell by the Move-tr/2D. Calculate the average velocity and standard deviation from the data of more than 30 cells using Microsoft Excel (Microsoft). When free swimming of motile cells is observed by phase contrast microscopy, a proper cell concentration is required. If the cell concentration is low, only a small number of cells are observed in a single movie. If the cell concentration is quite high, traces of each motile cell are overlapped, thereby making precise cell tracking difficult. The free-swimming motility is not affected at all by cell-cell interactions. Cells nonspecifically attached on a glass surface are often observed and so cannot show any free-swimming motility. So these cells must not be judged as non-motile cells. This protocol was modified from a previous work (Minamino et al., 2003). This research has been supported in part by JSPS KAKENHI Grant Numbers JP15K14498 and JP15H05593 to YVM, JP21227006 and JP25000013 to KN and JP26293097 to TM and MEXT KAKENHI Grant Numbers JP26115720 and JP15H01335 to YVM and JP23115008, JP24117004, JP25121718 and JP15H01640 to TM. Gabel, C. V. and Berg, H. C. (2003). The speed of the flagellar rotary motor of Escherichia coli varies linearly with protonmotive force. Proc Natl Acad Sci USA 100(15): 8748-8751. Minamino, T. and Imada, K. (2015). The bacterial flagellar motor and its structural diversity. Trends Microbiol 23(5): 267-274. Minamino, T., Imae, Y., Oosawa, F., Kobayashi, Y. and Oosawa, K. (2003) Effect of intracellular pH on rotational speed of bacterial flagellar motors. J Bacteriol 185(4):1190-1194. Minamino, T. and Namba, K. (2008). Distinct role of the FliI ATPase and proton motive force in bacterial flagellar protein export. Nature 451(7177): 485-488. Morimoto, Y. V. and Minamino, T. (2014). Structure and function of the bi-directional bacterial flagellar motor. Biomolecules 4(1): 217-234. Yamaguchi, S., Fujita, H., Sugata, K., Taira, T. and Iino, T. (1984). Genetic analysis of H2, the structural gene for phase-2 flagellin in Salmonella. J Gen Microbiol 130(2): 255-265.